Have your teachers been counting down the weeks until exam time since you came back to school in September? Are you feeling stressed or worried about your future? What if you fail? 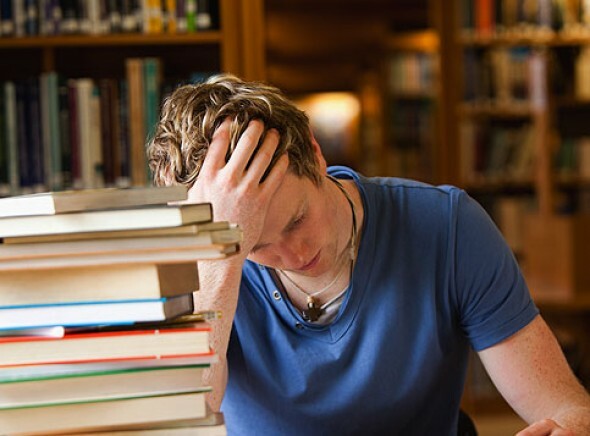 What if you don't get the grades you need for college or university or sixth form? Are you working too hard or not working enough? It's a tough time right now for a lot of students all across the UK. You hear a lot about people being stressed. So what is this stress thing anyway? Where does it come from? We all know how it feels but what causes it and what can you do to feel less of it? Stress is something you feel in your body. One of the major causes of it is having too much adrenalin in your system too much of the time. Another is having too much tension in your muscles too often. Adrenalin is released whenever we feel threatened or in danger. It gets us ready to respond to the threat by either running from it, fighting it or freezing and hoping the problem passes by without noticing us. Tension is another response to feeling threatened, unsafe or in danger. Our bodies are not designed to be in a constant emergency state. They work best when we have the right amount of calm and relaxation. When our bodies are relaxed it's easier for us to focus our minds and when we focus our minds on something pleasant it's easier for us to relax our bodies. Being relaxed and focused is your optimum state for achieving great results in exams. It helps you relax. All you need do is listen as you are guided through easy ways of calming your mind. It helps you build your confidence about exams. The Audio Patch is full of positive suggestions for your mind. Over time with repeat listening these positive ideas over ride any negative worry type thoughts you have about studying and taking exams. The third section of the Audio Patch helps you visualise yourself with the exam grades you really want. Visualisation is so important you'll be hearing and reading a lot about it from us as we get more and more content on our site. In a nutshell it involves making pictures of yourself in your mind and seeing yourself already with the things you want. It feels good and focuses your mind in the right direction for you. Have a look around on the internet and you'll soon find out that just about anybody who really gets what they want is using visualisation as part of their strategy for getting it. Visit the team page to see who makes makes Exam Magic tick or to contact us fill in the contact form. Our reminders will let you know about new articles and suggest current ones each week by email. If you wish to share this information please use the share buttons. All content in the Download area is for personal use only, no copying or distributing without permission.